“We are very thankful for the spiritual and theological gifts received through the Reformation,” said a joint message signed October 31, 2017, by the Lutheran World Federation and the Pontifical Council for Promoting Christian Unity on the conclusion of the year of the common commemoration of the Reformation. “We begged forgiveness for our failures and for the ways in which Christians have wounded the Body of the Lord and offended each other during the five hundred years since the beginning of the Reformation until today,” the statement said. On 31st of October 2017, the final day of the year of the common ecumenical Commemoration of the Reformation, we are very thankful for the spiritual and theological gifts received through the Reformation, a commemoration that we have shared together and with our ecumenical partners globally. Likewise, we begged forgiveness for our failures and for the ways in which Christians have wounded the Body of the Lord and offended each other during the five hundred years since the beginning of the Reformation until today. We, Lutherans and Catholics, are profoundly grateful for the ecumenical journey that we have traveled together during the last fifty years. This pilgrimage, sustained by our common prayer, worship and ecumenical dialogue, has resulted in the removal of prejudices, the increase of mutual understanding and the identification of decisive theological agreements. In the face of so many blessings along the way, we raise our hearts in praise of the Triune God for the mercy we receive. 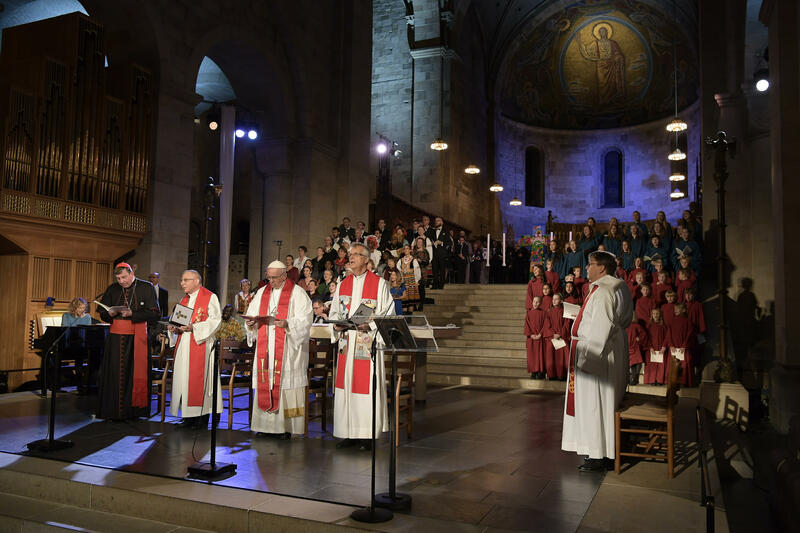 On this day we look back on a year of remarkable ecumenical events, beginning on 31st October 2016 with the joint Lutheran – Catholic common prayer in Lund, Sweden, in the presence of our ecumenical partners. While leading that service, Pope Francis and Bishop Munib A. Younan, then President of the Lutheran World Federation, signed a joint statement with the commitment to continue the ecumenical journey together towards the unity that Christ prayed for (cf. John 17:21). On the same day, our joint service to those in need of our help and solidarity has also been strengthened by a letter of intent between Caritas Internationalis and the Lutheran World Federation World Service. Among the blessings of this year of Commemoration is the fact that for the first time Lutherans and Catholics have seen the Reformation from an ecumenical perspective. This has allowed new insight into the events of the sixteenth century which led to our separation. We recognize that while the past cannot be changed, its influence upon us today can be transformed to become a stimulus for growing communion, and a sign of hope for the world to overcome division and fragmentation. Again, it has become clear that what we have in common is far more than that which still divides us. We rejoice that the Joint Declaration on the Doctrine of Justification, solemnly signed by the Lutheran World Federation and the Roman Catholic Church in 1999, has also been signed by the World Methodist Council in 2006 and, during this Commemoration Year of the Reformation, by the World Communion of Reformed Churches. On this very day it is being welcomed and received by the Anglican Communion at a solemn ceremony in Westminster Abbey. On this basis, our Christian communions can build an ever closer bond of spiritual consensus and common witness in the service of the Gospel. We acknowledge with appreciation the many events of common prayer and worship that Lutherans and Catholics have held together with their ecumenical partners in different parts of the world, as well as the theological encounters and the significant publications that have given substance to this year of Commemoration. Looking forward, we commit ourselves to continue our journey together, guided by God’s Spirit, towards the greater unity according to the will of our Lord Jesus Christ. With God’s help we intend to discern in a prayerful manner our understanding on Church, Eucharist and Ministry, seeking a substantial consensus so as to overcome remaining differences between us. With deep joy and gratitude we trust “that He who has begun a good work in [us] will complete it until the day of Jesus Christ” (Phil 1:6).